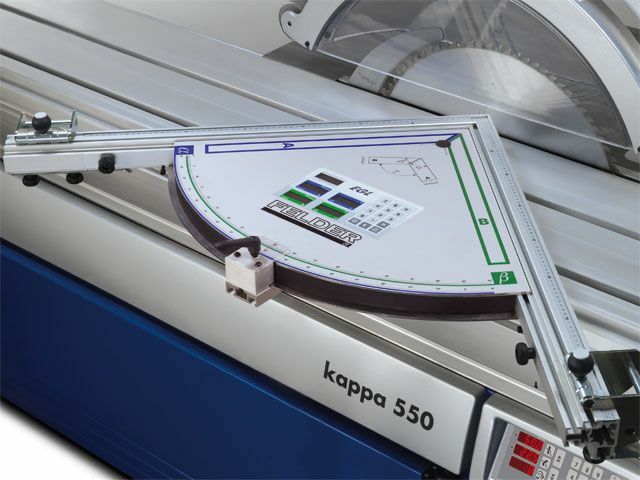 The first choice when it comes to panel saws: The particular highlights that impress with the kappa 550 e-motion are the automatic rip fence, unlimited tooling data storage positions and programable cutting programs. 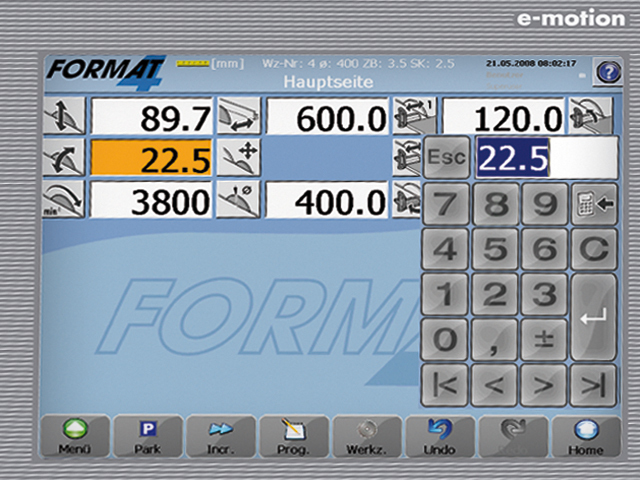 From the clearly laid out TFT touch screen control unit you can set all of the machine elements from a central position. 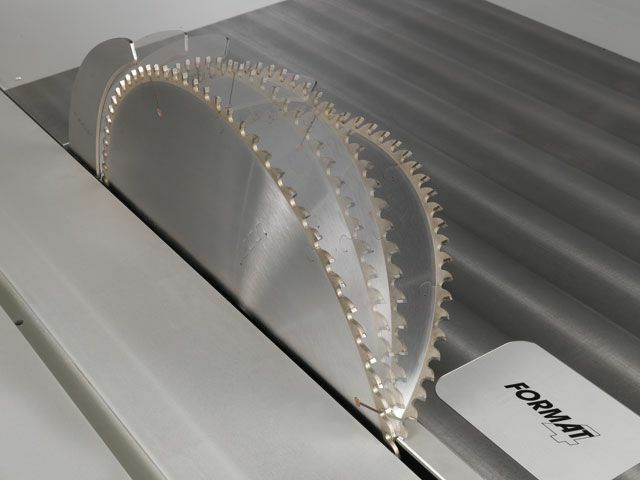 The newly developed Format-4 saw unit made from cast iron offers not only high performance and precision but also extreme smoothness and vibration absorption. 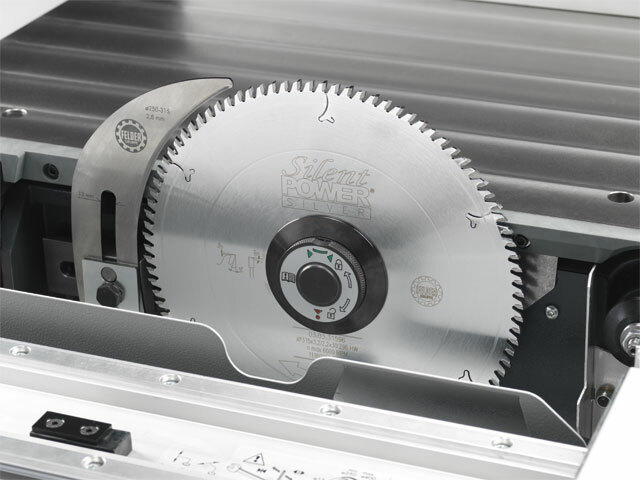 The scoring unit blade width and height adapt automatically to the stored tool information and also to the respective teeth width of the main saw blade. Any changes to these standard scoring settings can be saved and retrieved when using the same tool in the future. 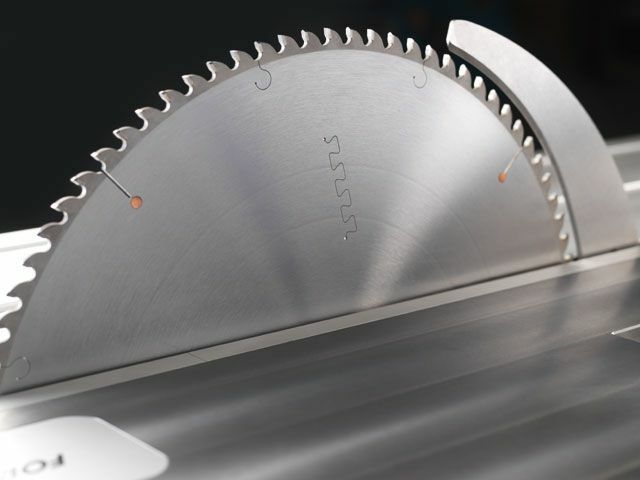 Removing the scoring blade when using large diameter saw blades is no longer necessary! 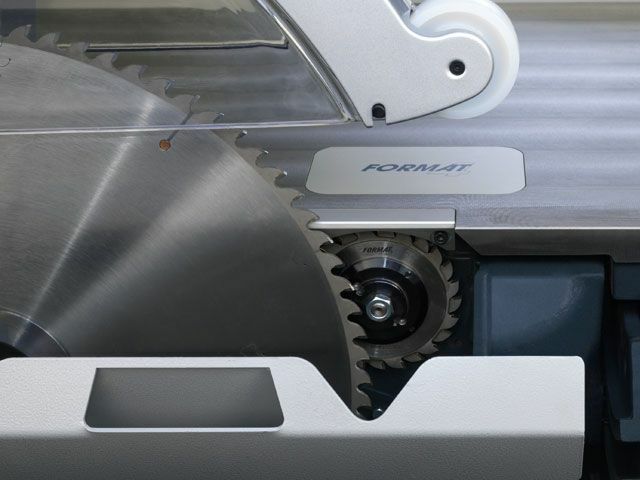 The new Format-4 parks the scoring blade at the touch of a button, leaving enough space for a large diameter blade, and in doing so, saves valuable production time. Additionally the park position also protects the scoring blade from resin. 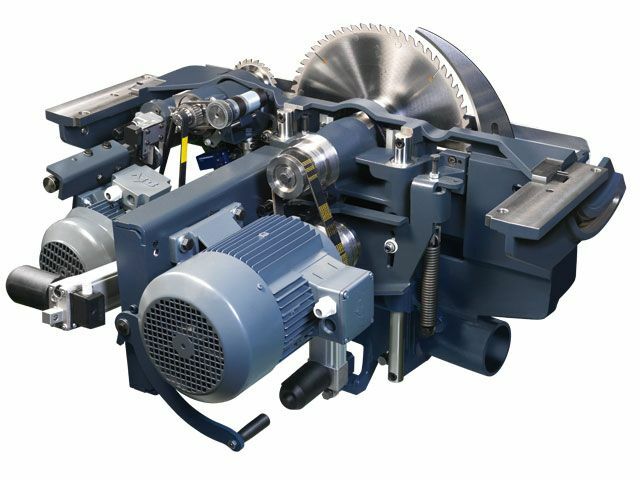 All processing phases can be carried out quickly, efficiently and centrally as a result of the integration of the Format-4 cutting optimisation system into the machine and operating concept. 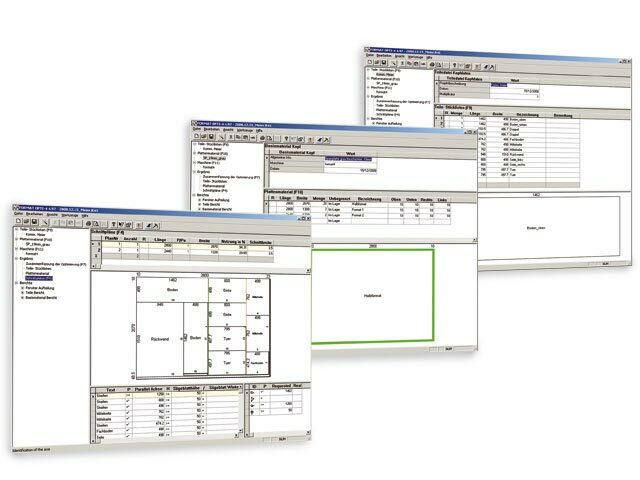 Training is not necessary as the user interface is intuitive, clear and easy to use. 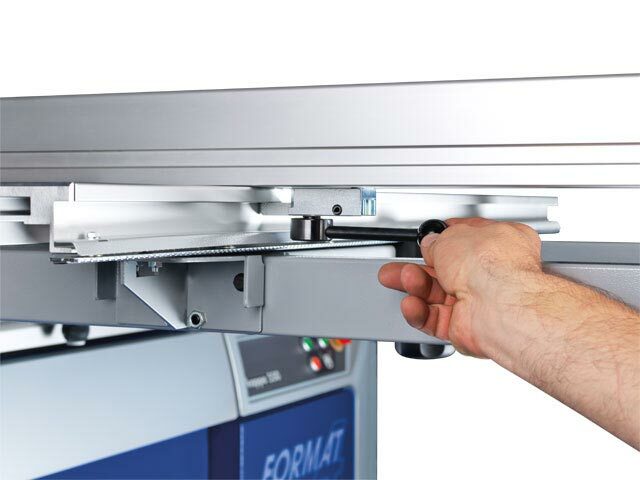 Not only does the label printer enable the workpieces to be labelled correctly, it also enables a logical post-processing. 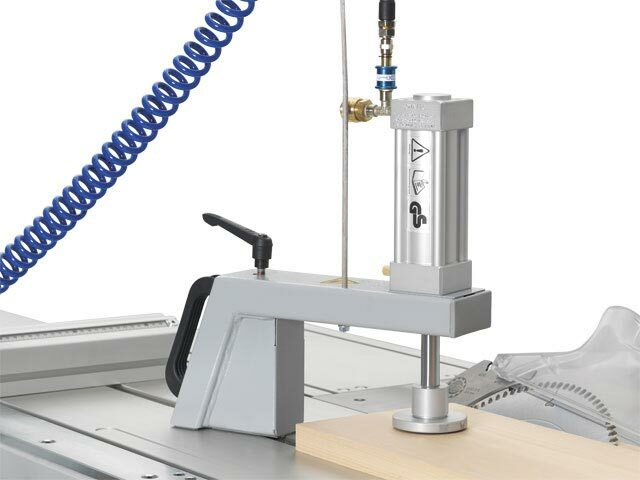 This makes it possible to load programs for subsequent processes on the CNC and edgebanders simply by using the bar code scanner. 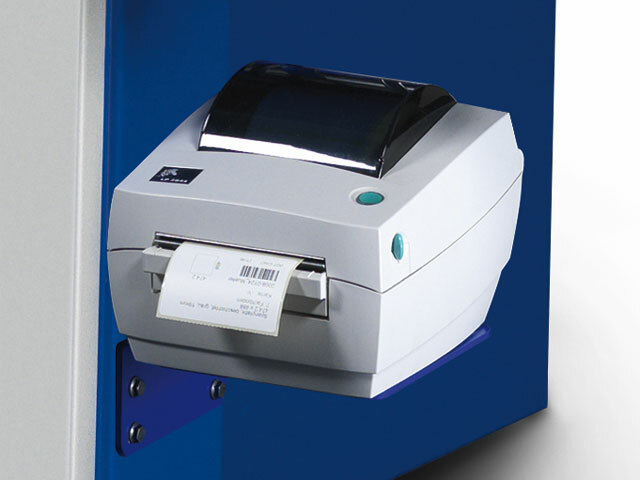 Save valuable production time with the label printer and increase productivity, quality and as a result, your profit. A masterpiece of ­engineering - The ultimate in precision and smoothness! 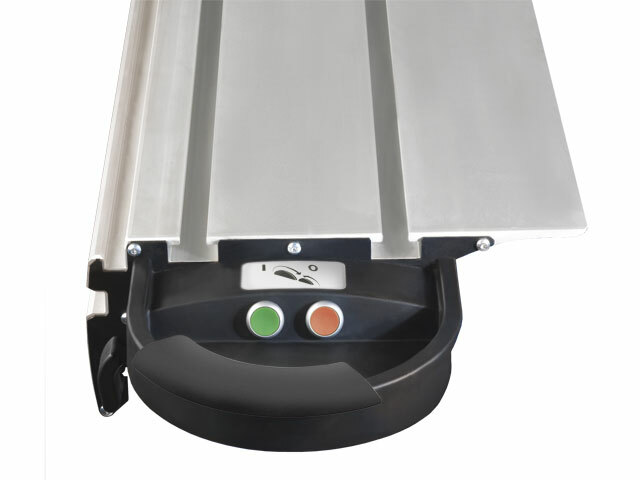 This precision guiding system will carry maximum loads without compromising the smooth and accurate stroke of the sliding table. 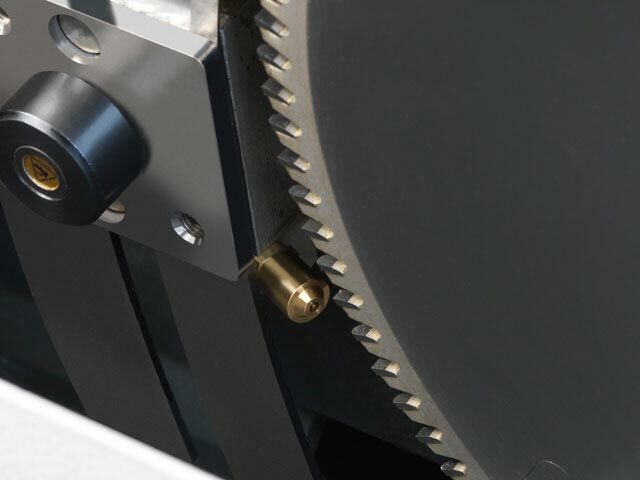 The “X”-configuration of the roller bearings optimally distributes workpiece weight to all sides. 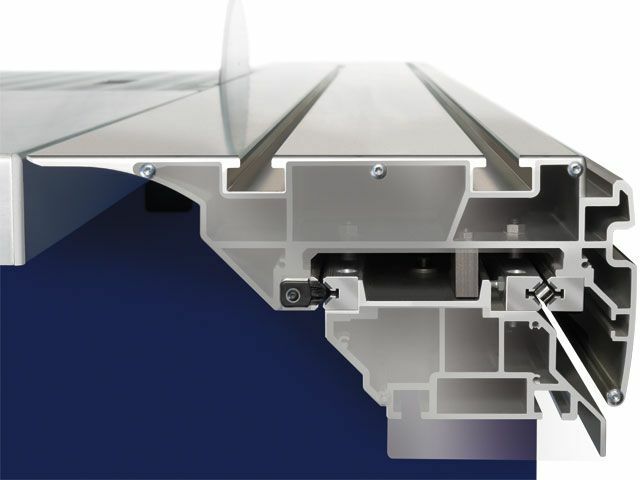 With a roller bearing system, the full width of the bearing is in contact with the guiding track. 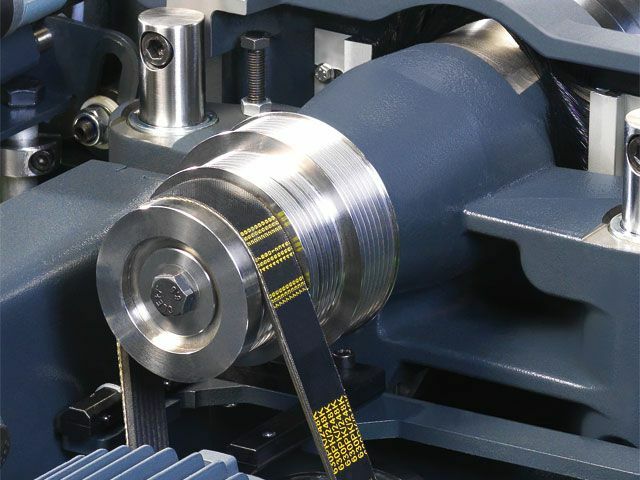 With no single point of contact between the bearing and the guiding track as found on conventional ball bearing systems, the roller bearing will never wear a groove into the guiding track. 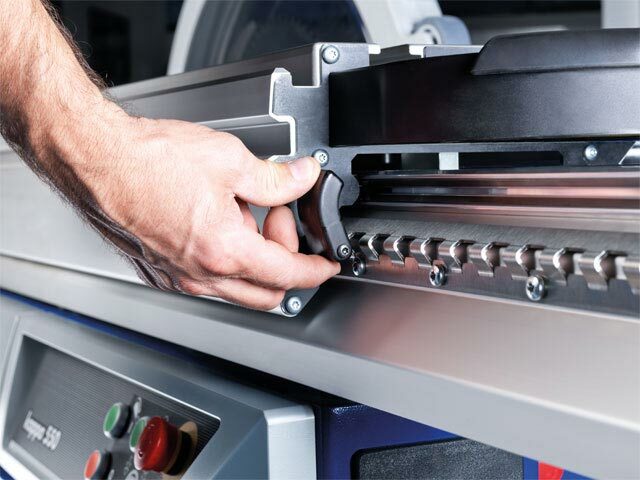 This ensures play-free guiding for the lifetime of the machine. 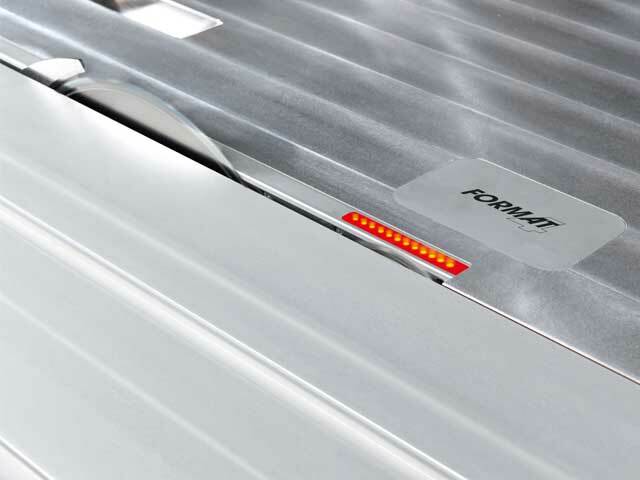 The “X-Roll” system is backed with a 10-year factory guarantee. 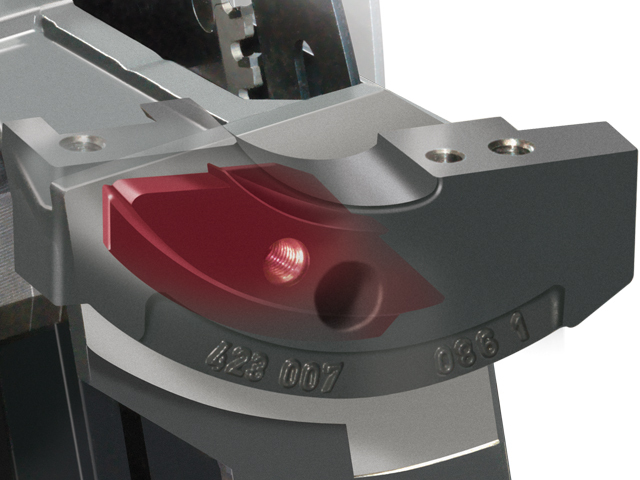 Infinite adjustment range –45 bis +45°. 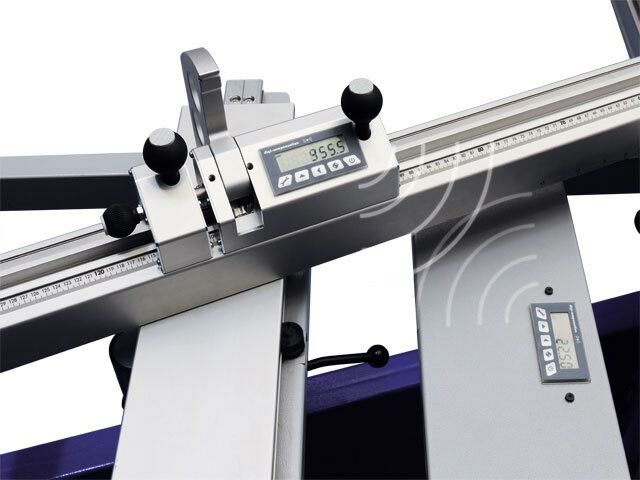 The LED display enables you to set the required angle to one tenth of a degree. 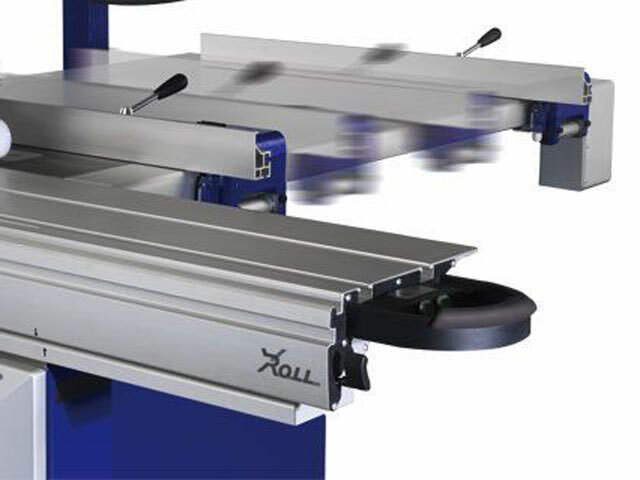 Mitre length compensation is done via the vernier scale with the standard fence, with the CNC crosscut fence the length compensation is automatic. The outrigger table can be swung out of the way with ease! No more time consuming, complicated assembling and removing of the outrigger table. 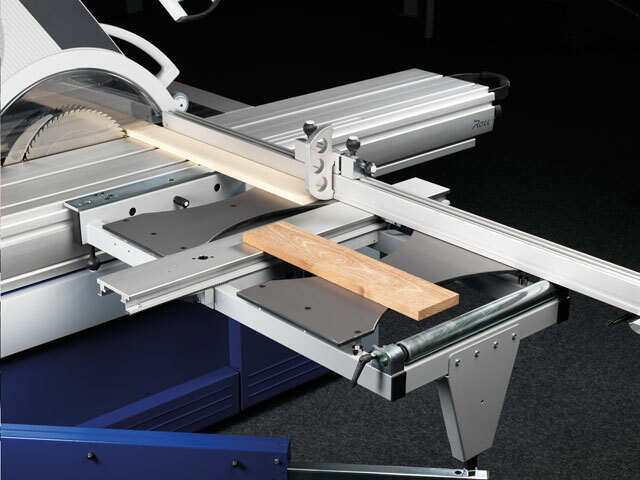 The outrigger table swing away system ensures extreme ease of use and at the same time can provide you with extra working space when you need it. 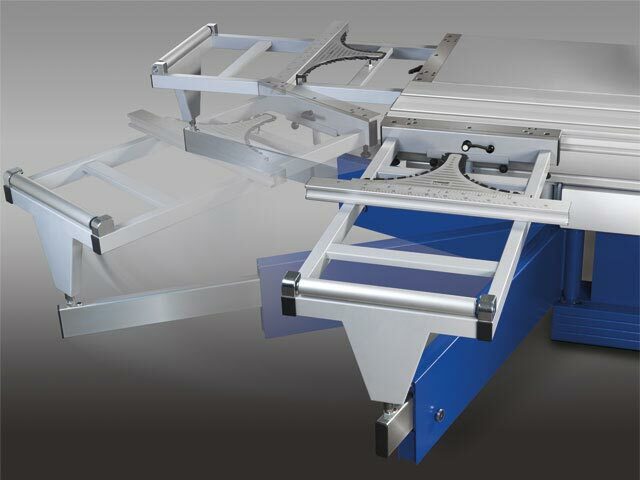 The newly developed overhead saw guard and dust removal system deliver perfect extraction results. 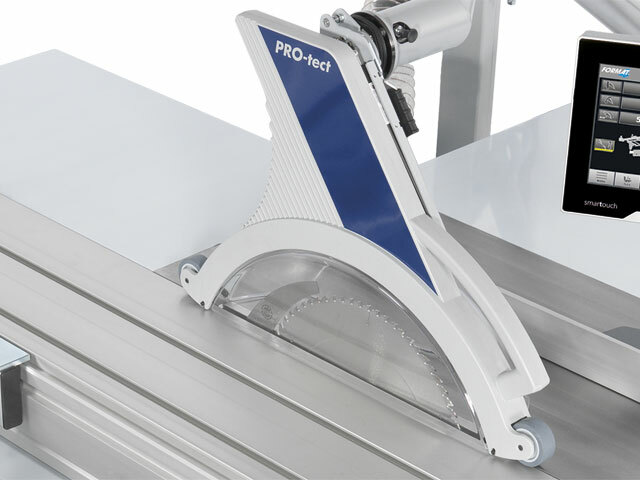 The overhead saw guard, with its striking design, runs on linear guides that help to facilitate the height adjustment. 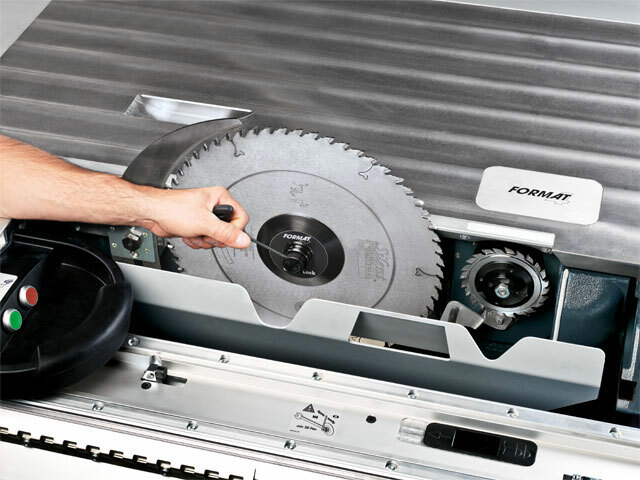 The dust and shavings are sucked from the saw guard into the extraction pipe via a short hose. 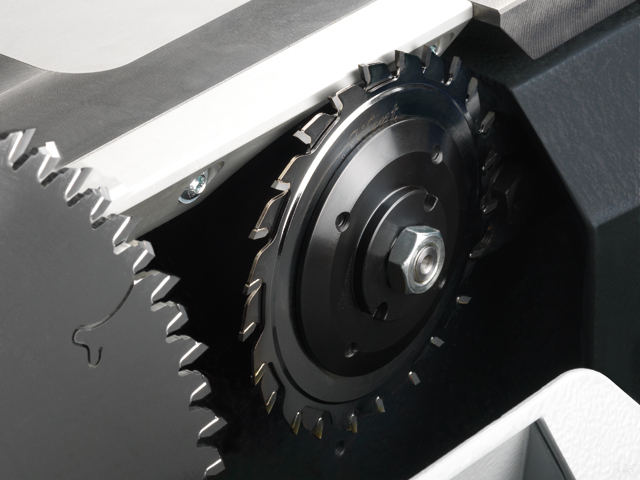 The dust extraction below the table encloses the complete saw unit. 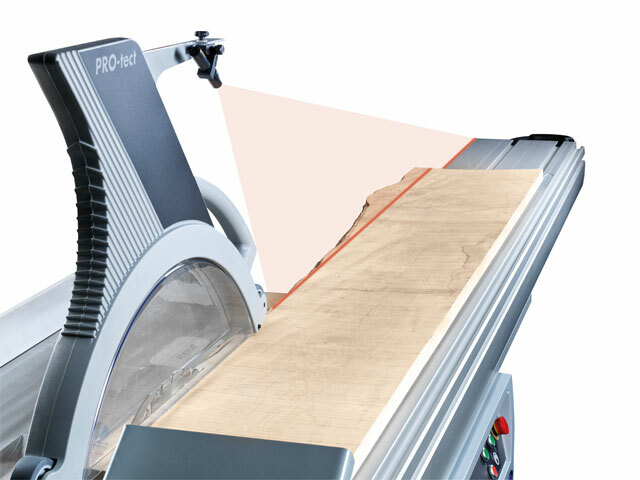 The dust channel is the perfect design to provide an optimum air flow and perfect main blade and scoring unit extraction results. 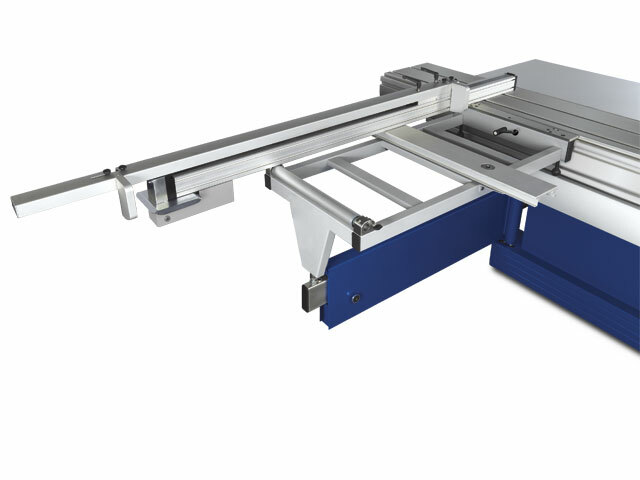 For crosscuts between +45° and –45°, the crosscut fence is set with a mitre scale, which is integrated into the sliding table. 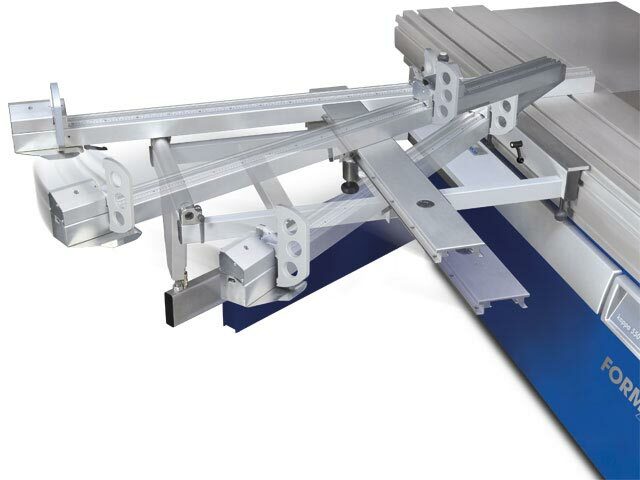 Quick attachment without tools is made possible by a T-slot and quick coupling on the side of the sliding table. 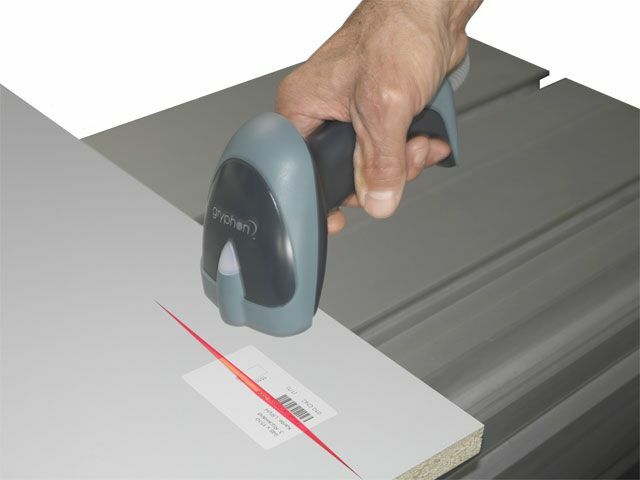 The mitre scale and the magnifying glass on the fence stop, readable from the operating area, allow you to make precise adjustments. 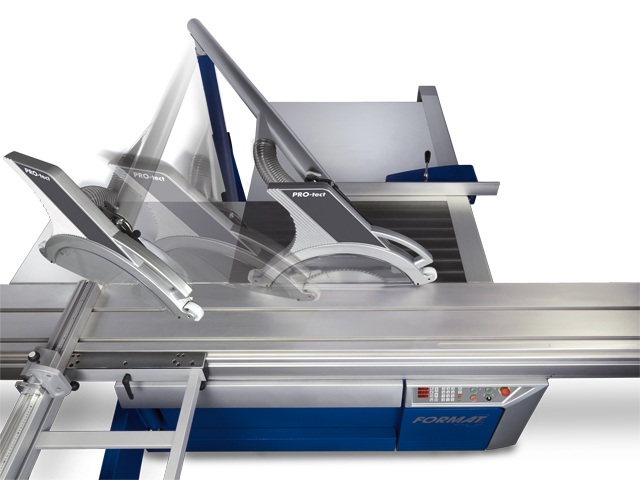 The ideal accessory for parallel cuts on the sliding table. 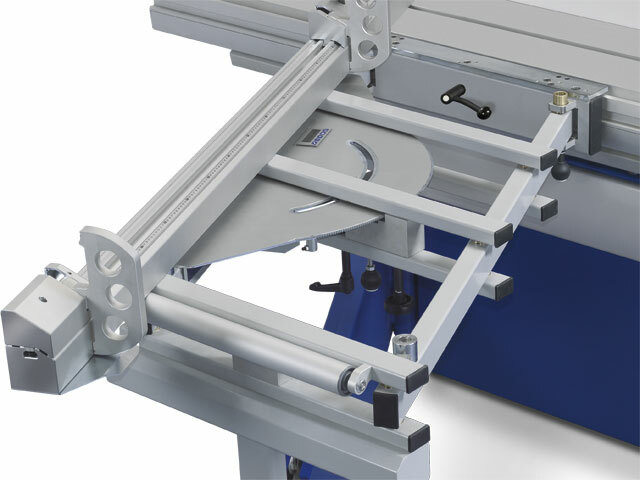 Use your sliding table and the outrigger together with the rip fence to guarantee an exact workpiece positioning. 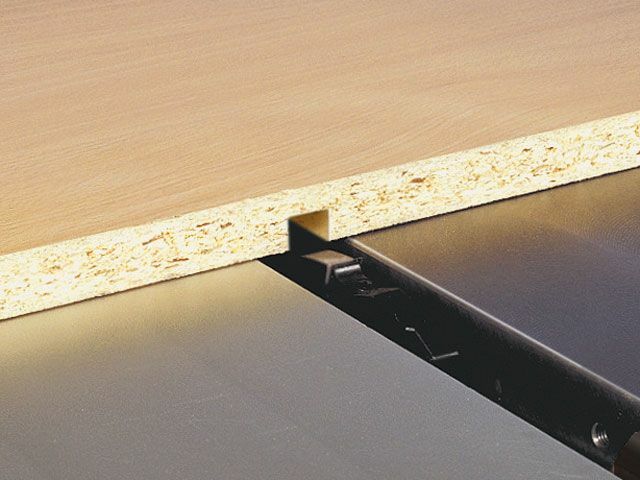 The rip fence is clamped to the sliding table. 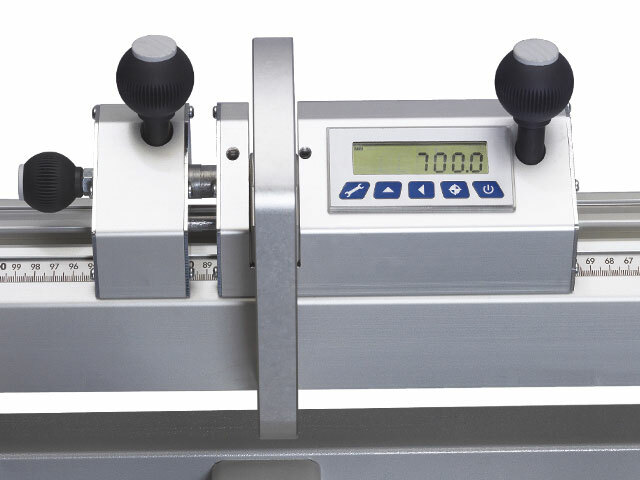 The integrated scale from 25 to 1000 mm can be easily read through a lens. 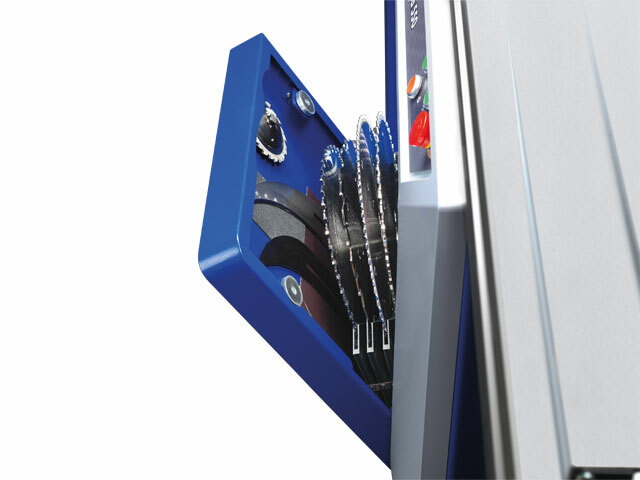 One of the valuable accessories in daily use on woodworking machines is the patented double mitre gauge from Format-4. 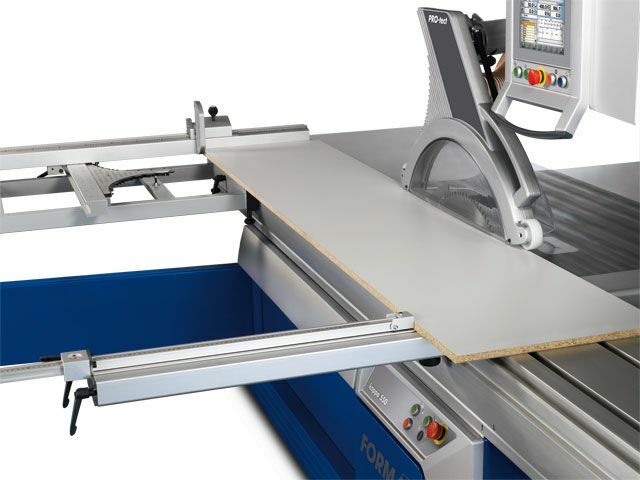 It enables double mitre cuts on workpieces of different widths at any angle. 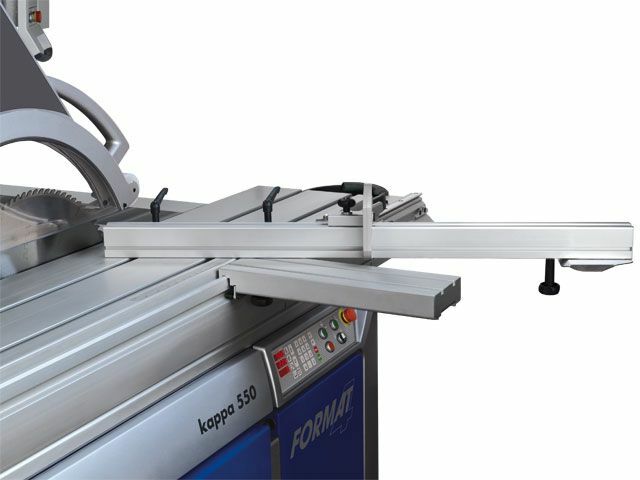 The input of the workpiece widths A, B and the input of the desired frame angle, is carried out on the integrated computer via the keypad. The resulting settings appear correct to within a tenth of a degree on the display. Just set the double mitre gauge at the calculated value and work away with a result of … pinpoint accuracy! 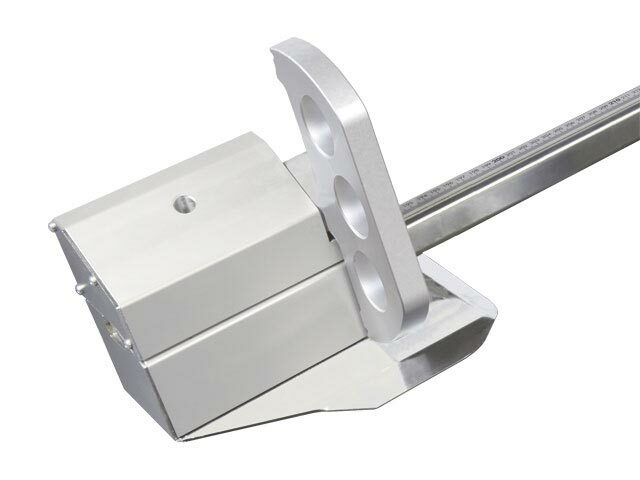 The fence stop on the fence plates can be adjusted up to 1350 mm with the scale. 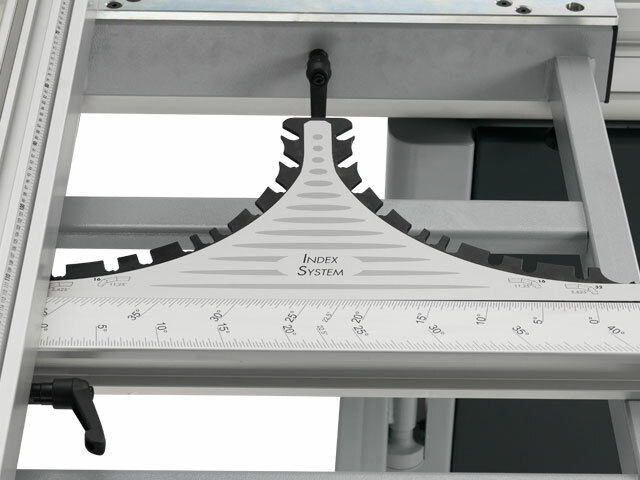 Depending on the set angles, the length compensating vernier scale is available. 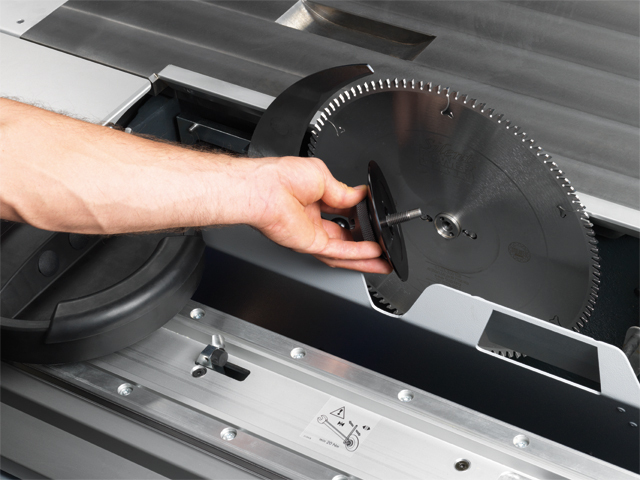 This feature also enables you to set the exact workpiece length when making mitre cuts. 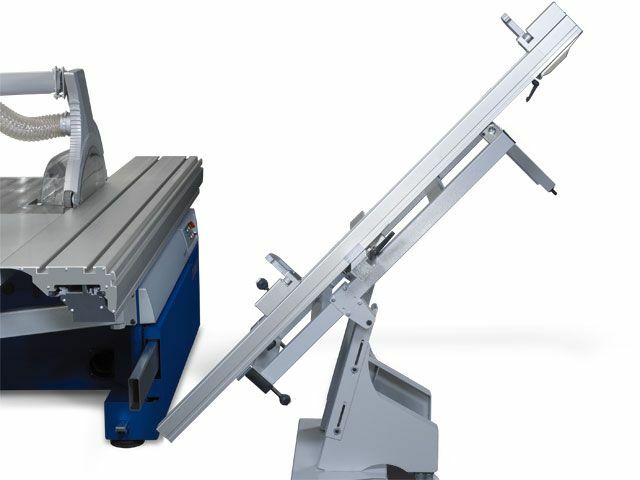 At last: quick, comfortable and effortless, removal and installation of your outrigger table with the help of the transport and mounting unit. Another positive aspect: your outrigger can be conveniently stored away!